There’s something about a wild horse. It’s difficult to put your finger on. It attracts you, mesmerises you, pulls heartstrings you didn’t even know you had, and makes you feel you could open that farm gate and run off into the wilds. It’s a kind-of Free Willy experience. It’s an entirely acceptable universal reaction but actually rather a strange one considering that humankind has spent over 4,000 years domesticating the horse. We have utilised, abused and exploited horses over the millennia to advance civilisation – using them for transportation, work, exploration and in wars. Before motorised transport, we lived, moved and dreamed from the back of a horse. Strange as it is, after all our time spent domesticating the horse, wild horses symbolise a freedom we long for and admire. 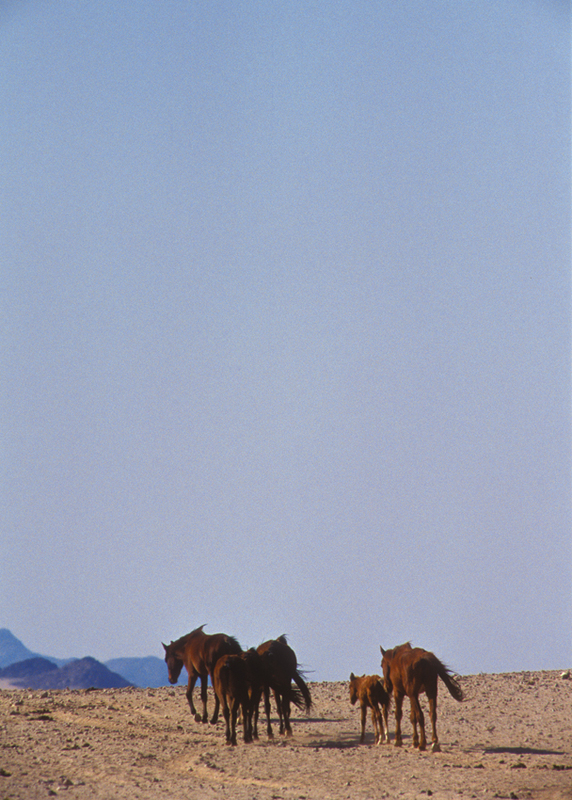 The wild horses of the Namib Desert also epitomise something else. 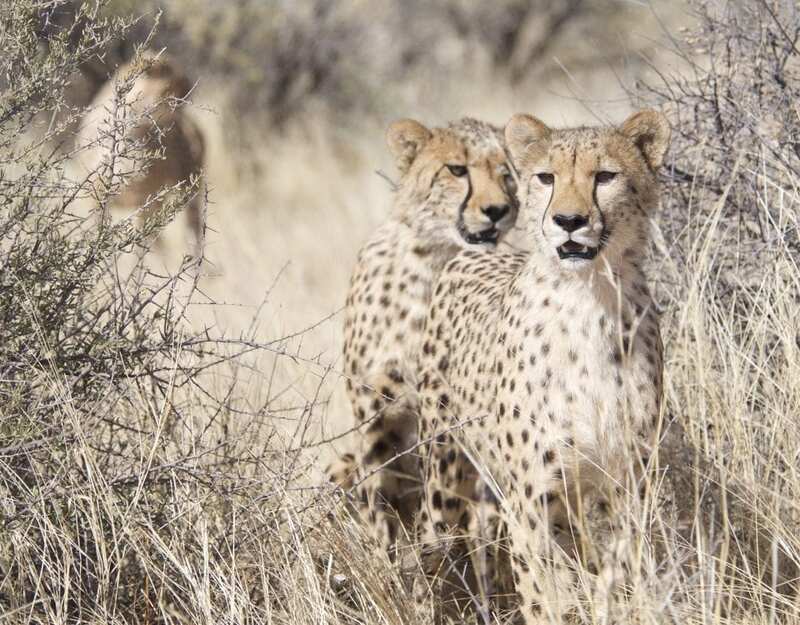 They embody the rugged and wild spirit of Namibia, the very words that Namibia Tourism has coined to describe this exceptional country, and over the years have become a tourist drawcard and highlight when visiting south-western Namibia. 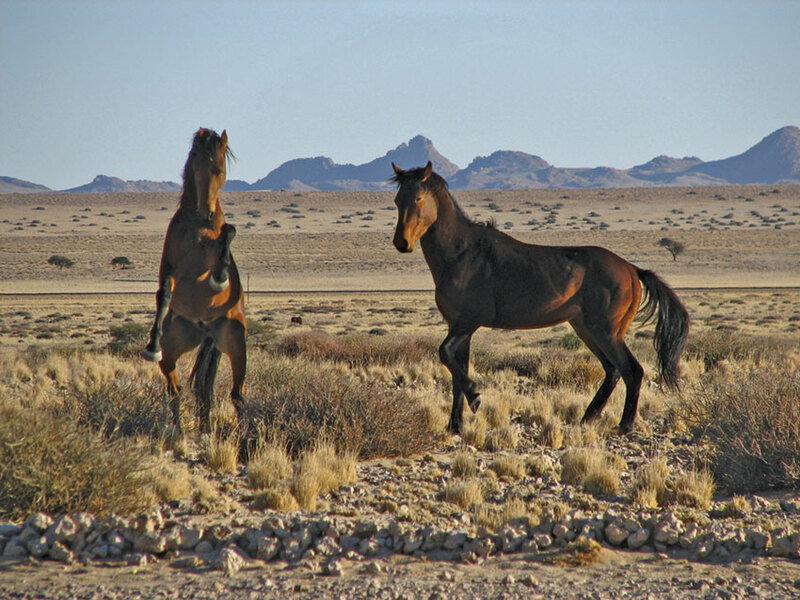 They are not new to Namibian soil, having already spent a century, over seven horse generations, living in the Namib Desert. But, how did they get there? There have been many theories about their origins, some stranger than others, involving a shipwreck and a distraught widow letting stud horses free. Most can be discounted due to the huge distances the horses would have had to travel through arid areas. 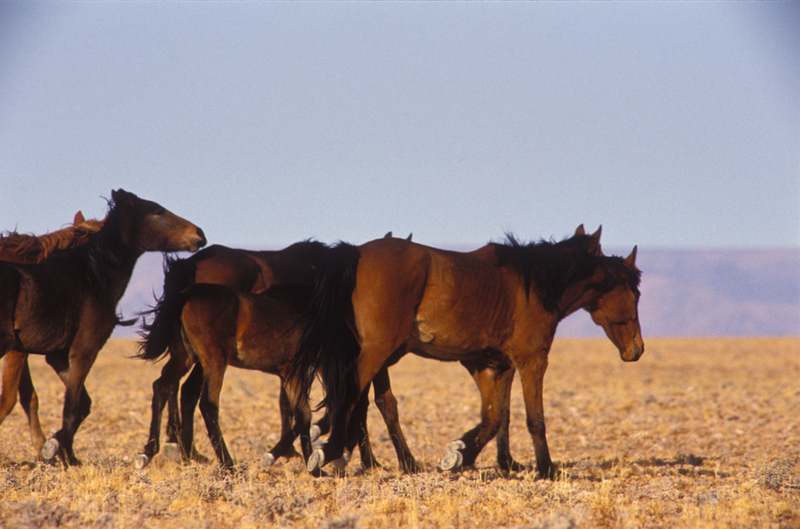 There are two theories, however, that have endured, and these are the most likely beginnings of Namibia’s intriguing population of wild horses. In the time of German South West Africa, at the beginning of the 20th century, the south-western corner of the country and the town of Lüderitzbucht prospered. Sparked by the discovery of a diamond by a railway worker outside the town in 1908, a diamond rush swept through the area. Diamond towns sprang up, champagne flowed and the desert sparkled with a hope that trader Adolf Lüderitz was still dreaming of when his boat disappeared under the icy waters of the Atlantic Ocean. It was at this time that influential mayor, Emil Kreplin, established a stud farm at Kubub, 150 km to the east, in an area with better grazing and water. Here he bred workhorses for the diamond fields and racehorses for the thriving town, and was known to import new breeds into the racing arena. Fates changed suddenly in 1914 when WWI and Union of South Africa soldiers arrived on the country’s doorstep. Kreplin was interned for the duration of the hostilities and later returned to Germany, where he lost all his diamond wealth in the depression years following in the wake of the war. 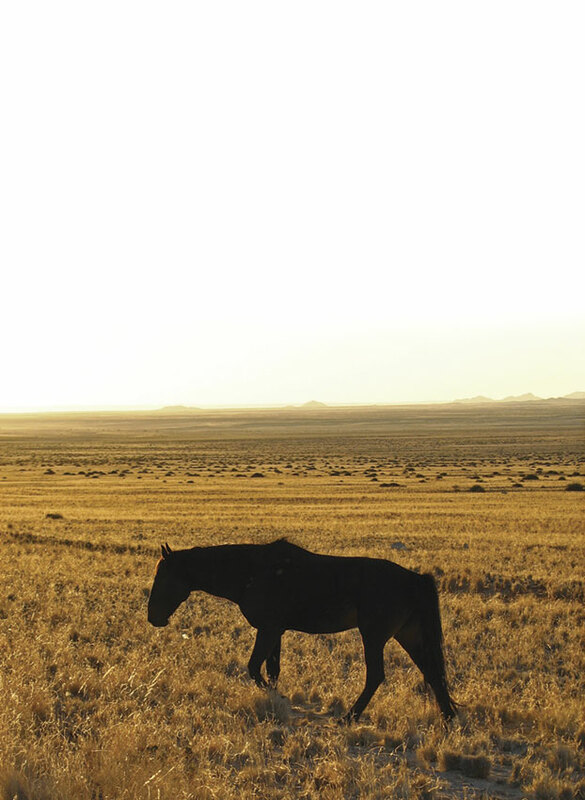 His horses at Kubub, uncontained by fences, are presumed to have left the farm that was overgrazed during the war years, gradually making their way to Garub, 35 km away. The Garub borehole, which provided water for the steam trains, was the only source of water in the desert during the dry winter months. At Garub the Kubub horses would have joined others that were abandoned during the war. And this is where the second theory slides in seamlessly. Thousands of Union soldiers – and their horses – were based at Garub, in pursuit (although a rather slow one) of the Germans who had entrenched themselves at Aus, preparing for confrontation. A German airplane flew over the Union base several times during this period, but only bombed it three times. The last time, on 27 March 1915, was to mask the Germans’ retreat. The bomb caused havoc at the Garub base, scattering the military horses assembled there. It is thought likely that some of these horses would have run off into the hills in fright, gathering at the water pools that remained after the summer rains and escaping capture by the Union soldiers. Pawns in a chess game of human conflict, the horses did what they knew best. They survived. 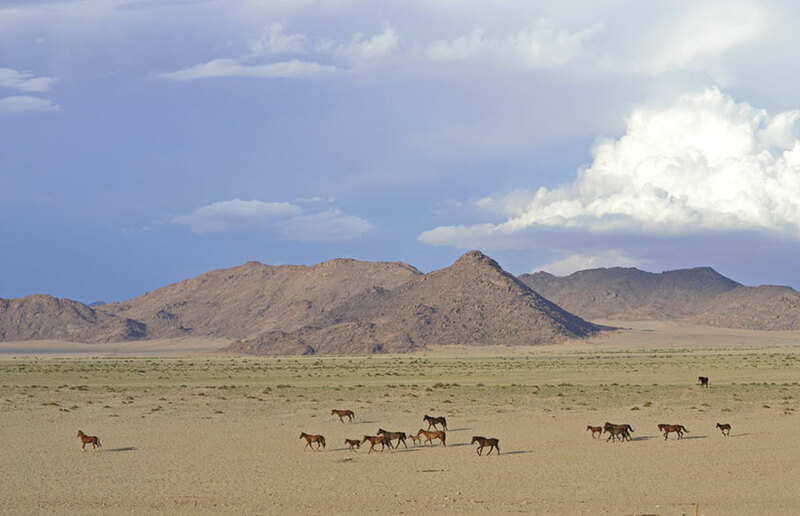 It is uncertain how many of each group assembled at Garub (and there is the possibility that other horses abandoned in the chaos of war might have joined them), but it seems plausible that the Kubub stud horses formed the core of the wild-horse population. Photographs taken of the Kubub horses at the time reveal significant similarities in conformation and characteristic markings to the wild horses of today. The traces of good breeding are still visible. As luck would have it, the Garub area was part of the forbidden diamond area, the Sperrgebiet, which provided a protective enclave for the horses over the years. The northern part of the Sperrgebiet, including Garub, became part of the Namib-Naukluft Park in the late 1980s, granting further protection. A new borehole was opened for the wild horses, further east, and a hide was built at the viewpoint overlooking the waterhole, giving visitors prime seats as the horses come in to drink. And drink they do, cantering in from the plains and stirring many a heart. But, it hasn’t all been plain sailing for the horses. 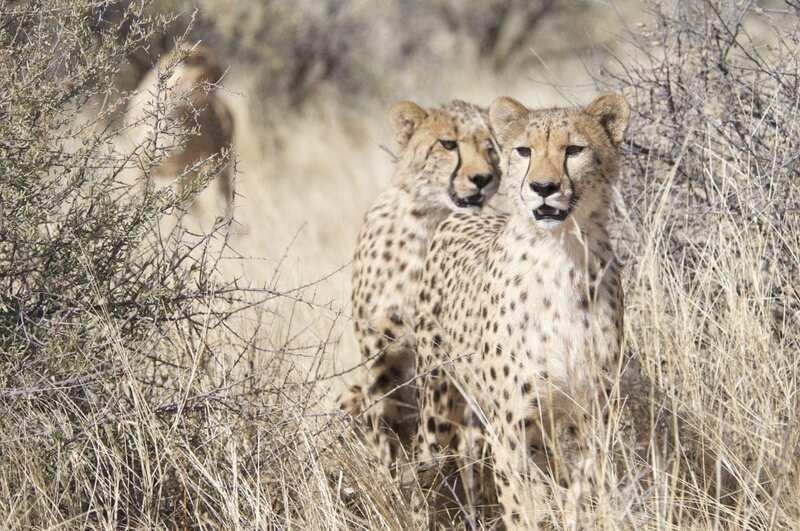 Being wild entails living according to the seasons, and in Namibia and in the Namib Desert in particular, this includes dry seasons and years of drought. 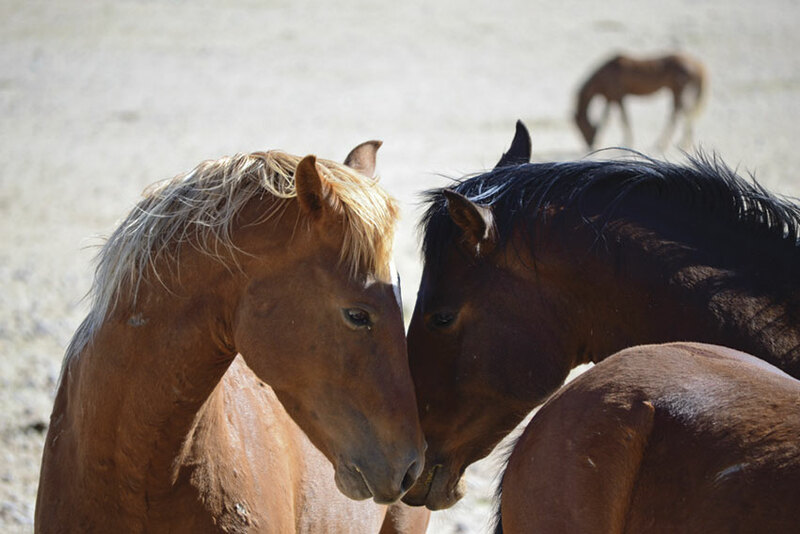 Our dream of wild horses has to take a romantic step back and make space for the reality of living in the wild. On the upside, the droughts serve to keep the population numbers in balance with the carrying capacity of the land. They also keep the genes of this Namib population strong. However, the horses have to face other challenges in their daily lives, including the risk of being hit by vehicles on the main road that bisects their area, and being preyed on by spotted hyena. 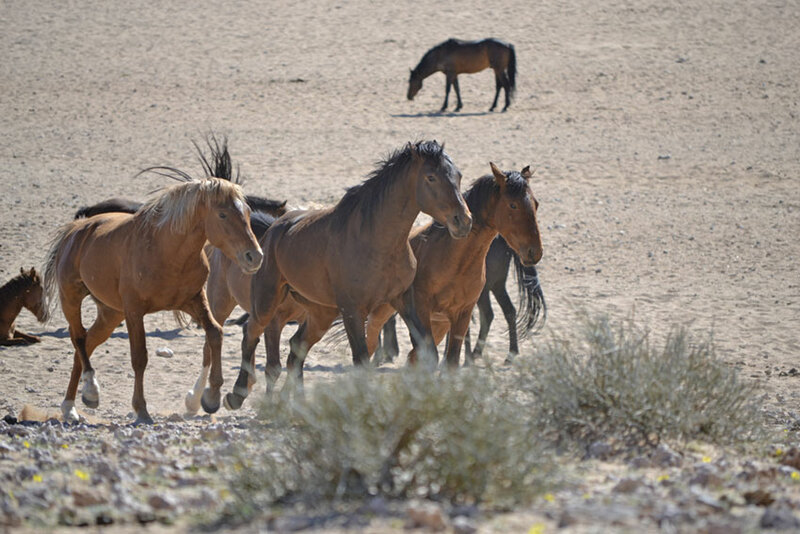 But these resilient horses, like the desert country that is their home, continue to survive, delight and enthral us by being the strong, rugged, wild and free animals they are. A century down the line, they are in tune with the land, and have become part of it. There is little to match the experience of watching a family group appearing at the crack of dawn, with the first rays of sunlight catching their manes and dust exploding from their feet as they move with the life-affirming presence of animals that have, against all odds, gained and retained their freedom. 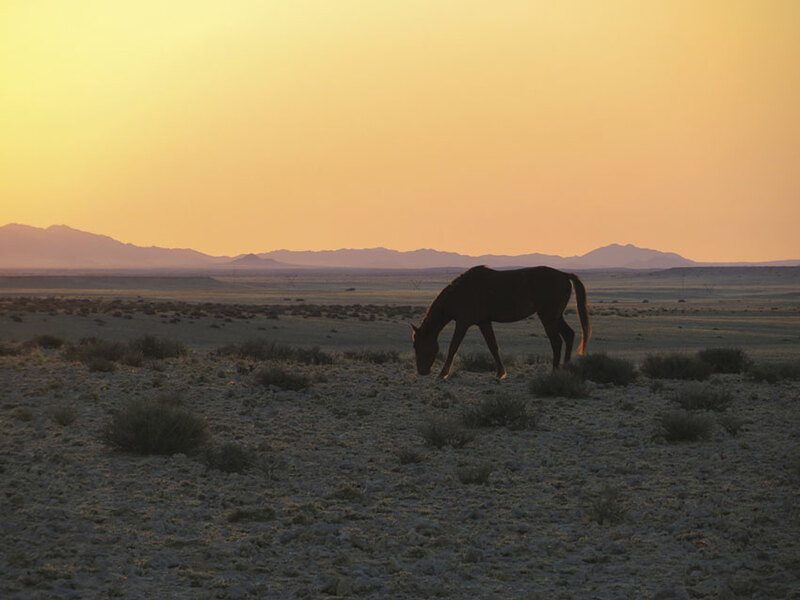 How does a wild horse behave? 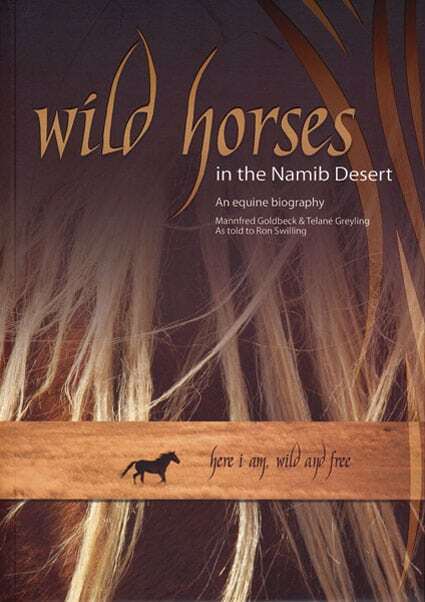 although people have mistakenly thought that the wild horses are hardier than domesticated horses because of their harsh existence in the Namib Desert, experience has shown that they haven’t fared well in domestic situations. They have struggled to adapt to new environments and without immune-providing antibodies are immediately susceptible to diseases. Trial and error has proved that the horses are best left in their home in the national park. A non-profit association established in 2012, the Foundation comprises seven directors from the tourism, veterinary and environmental management and research sectors. The aim is to monitor the horse population and environmental conditions of the horses to provide further information to the Ministry of Environment and Tourism (MET) to serve as advice and assistance for appropriate management practices. All financial contributions are welcome. that there are pockets of wild horses on virtually every continent in the world? that all wild horses (with the exception of the Mongolian Wild Horse or Przewalski’s Horse) originated from domesticated stock?